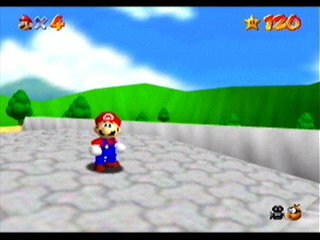 This website is all about Super Mario 64, and particularly focuses on various challenges found in the game. The video was spliced. The allegations are true. The evidence speaks for itself. Formerly one of the most well-respected SM64 players, this is truly unfortunate news. While explaining himself, Myles gave the reasoning that he thought "cheating was growing out of control in this game". As one of the primary people responsible for verifying SM64 records over the timeframe in question, I take such allegations personally. To the best of my knowledge, none of the records archived on this website were achieved by cheating, although some were accepted on the honor system. If anyone has any evidence of cheating that I was not aware of, please contact me (cbright). I have also updated the 16-star record page with the times of the current world record as recorded by MarioRuns. A lot has happened in the intervening time, and the current record is almost 3 minutes faster than Myles' claimed time! I've been informed that the impossible coin has been obtained. Last month the legendary Myles Bukrim completed an amazingly clean 16-star run, finishing the entire game (from first gaining control of Mario to Bowser's final star) in a mere seventeen and a half minutes. You can watch the video on YouTube — a symphony in three parts — or download the run (courtesy wrvids.com). The run should also be available on SDA in the near future. This is the first known improvement to the record since Marius 'Holy Moly' Mollenhauer and Jacob 'LeCoureur103' Cannon battled over the record during the summer of 2005. Marius claimed to have a time of 18:14 and Jacob claimed a time of 18:08, but the battle fizzled out after spezzafer's 16:25 tool-assisted test run was released. Except for a 19:01 video from Marius, their videos never made it online. [Update July 6, 2017: Marius' video was also discovered not to be recorded in a single take.] Thus, Myles' video beats the fastest available video by a minute and a half. Star choices and times for various videos are available on this page, including an old run Myles himself made in 2005. We've already seen how Myles dominates the races, but his star times are also top notch and on the last update he passed Thiago in our points ranking. Congratulations Myles! On an unrelated note, the http://www.student.cs.uwaterloo.ca/~cbright/sm64/ link is going to stop working shortly; simply stick to www.sm64.com. "What if everything you see is more than what you see - the person next to you is a warrior and the space that appears empty is a secret door to another world? What if something appears that shouldn't? You either dismiss it, or you accept that there is much more to the world than you think. Perhaps it really is a doorway, and if you choose to go inside, you'll find many unexpected things."